Aura crystals are partly natural and partly man made. The crystals are clear or cloudy quartz that has been treated with atoms of precious metals. There are now two methods of creating aura crystals. Place a crystal specimen in a vacuum chamber where the quartz is heated to a set temperature, then a metal vapour is added to the chamber. The metal atoms fuse to the crystals surface, which gives it an iridescent metallic sheen. Another process of creation is by using a natural electrostatic charge on the crystal this process is generally done with the titanium molecules. ​These quartz crystals have an incredible iridescence and they are generally processed using quartz clusters and points. They are have a high vibration healing energy. These crystals are created in the USA but India and China have begun experimenting in creating these specimens. 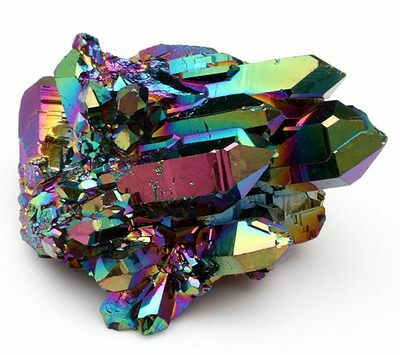 Aqua Aura quartz was the first aura crystal developed and still the most readily available. Aqua Aura quartz has an intense energy reflecting the alchemical process that bonds gold onto pure quartz. Aqua aura quartz frees you from limitation and creates space for something new. This crystal heals, cleans and calms the aura. It releases any stress, it then activates the chakras, especially at the throat where it encourages communication from the heart. Aqua Aura quartz releases negativity from subtle energetic bodies and from the connections the spiritual body makes to universal energies so that you can achieve your highest potential. Aqua Aura quartz stimulates channelling and self-expression, and deepens spiritual attunement and communication. It is a protective stone that safeguards against psychic and psychological attack​. 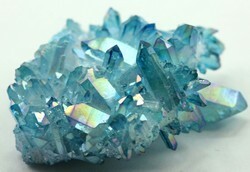 Aqua aura quartz sends profound peace to you during meditation. Aqua aura quartz enhances the healing powers of other crystals when it is used with them. Aqua aura strengthens the thymus gland and the immune system. Angel Aura quartz has an intense strong energy that cleanses the aura. Angel aura quartz is created by bonding platinum and silver onto a clear quartz crystal. The crystal is light blue with a silvery iridescence. This is a stone of romance and love. It is a crystal of joy, and like a rainbow, signifies hope and optimism. Angel aura quartz is a great healing stone that aids in meditation, spiritual healing and aura spellwork. It promotes peace and tranquility. This is an excellent stone for cleansing and brightening the aura and to stimulate healing. Angel aura quartz will assist you in contacting your angel guides so that you are able to remember lessons from past incarnations and it assists in discovering your spiritual purpose. Angel aura quartz is aligned with the throat chakra to enhance communication, in romantic pursuits, in caring for children and the aged, and in all healing situations. It may also be used to align and purify all chakras. 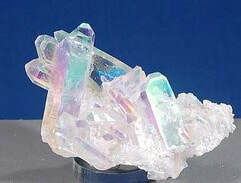 Angel Aura quartz is particularly helpful for autism, asperger’s syndrome and the nervous system. It is great for anxiety, panic attacks, phobias, and for use in reiki healing, reflexology and shiatsu. 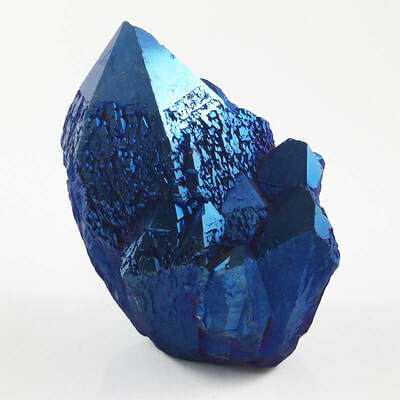 Cobalt Aura crystals are produced by bonding pure quartz crystals with cobalt. ​Cobalt aura quartz is a powerful antidepressant, lifting the spirit and bringing deep peace. When activating the throat chakra this stone enhances communication ability. This stone helps you speak your truth to yourself and others. Cobalt aura quartz will help you become an active listener. Crystal water made with the indirect method will treat throat infections, stomach ulcers and stress. Applied externally, it relieves inflammation, sunburn and stiff necks or muscles. ​Flame aura quartz is a clear quartz that has been bonded with titanium and niobium. The resulting crystal is a deep dark blue to violet with flashes of gold. Flame aura quartz can be used for spiritual initiations and rituals. When used during meditation it assists you to reach that meditative state more easily and offers you spiritual attunement. Flame aura quartz draws kundalini energy up the spine and through the subtle bodies, adjusting its effect to provide what is needed at the time. Flame aura quartz stimulates the third eye and higher crown chakras, by enhancing your focus. It is a beneficial stone for creating and maintaining a state of homeostasis within the physical and emotional bodies, and may be useful in the treatment of diabetes, cellular and bone cancers, multiple sclerosis, and in stimulating the immune system of AIDS patients. Opal Aura Quartz is created with atoms of platinum and silver creating a pale rainbow effect on the crystal. Opal aura quartz gives you hope, optimism and joy for yourself, so that you can share with others. This stone purifies and balances all the chakras and integrates the light body into the physical realm. Opal aura quartz opens you to a deep state of meditative awareness, grounding the information received from the spirit realm into your physical body. Opal aura quartz will open aid you when connecting to the divine universe. 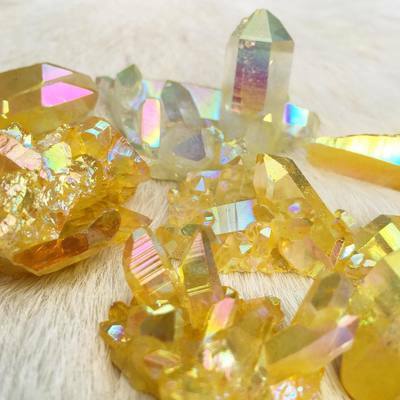 Rainbow aura quartz is formed through the bonding of gold and titanium onto clear quartz. Rainbow aura quartz activates all the chakra energy centres of the body. It clears a path for your life force to manifest, which then brings you more energy into your life so that you can appreciate and move through all of life's situations with joy. Rainbow aura quartz is helpful for dysfunctional families as it release all the negative emotions such as anger, resentment and grief. When meditating with this crystal and focusing on the dysfunction you will be sent insights into the cause of the problems. Rainbow aura quartz when placed around the home will bring harmony into the family. This stone will cut negative karmic ties that may be hindering relationships in the current life. Rose Aura is formed through the bonding of quartz and platinum and gold or silver to enhance the rose colour. This stone has a dynamic energy that works on the pineal gland and the heart chakra by changing deeply held doubts about your self worth. Rose aura quartz will show you during meditation that unconditional love and a soul mate are within reach. Reiki or reflexology healing with this crystal will instil homeostasis within the physical body. 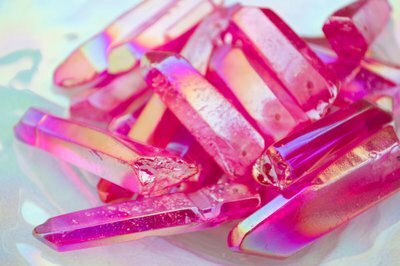 Rose aura quartz will enhance the knowledge that you are perfect as you are currently it will also dim the memories of being abused, deserted or rejected so that you can move forward with a lighter heart. Rose aura quartz can ease the onset of puberty in girls and early menstrual difficulties in teens. This crystal is also thought to assist with the emotional problems that arise with a teenage pregnancy, especially if the young woman isn't supported by the father of the child. It is thought that rose aura quartz will assist in emotional and multidimensional healing, ameliorating anger, and soothing burns. Ruby Aura is formed through a bond of quartz and platinum, gold and silver. Higher levels of the metal atoms are used to create the deep ruby red of this crystal. 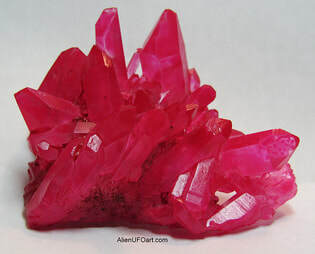 Ruby aura cleanses the base chakra of physical, mental and emotional abuse, bringing passion, vitality and wisdom to the heart. This is a protective crystal against aggression and violence. It benefits the endocrine system and is a natural antibiotic for fungal infections and parasites. It is thought to enhance the healing of sciatica, lower back issues and slipped discs. Sunshine Aura is formed through a bond of gold and platinum. Its energies are powerful and extremely active. It activates and cleanses the solar plexus chakra, releasing old emotional trauma and hurt. Sunshine aura is expansive and protective, it relieves constipation on all levels and releases toxins. Placed in the center of any healing crystal layout, Sunshine aura quartz infuses the whole system with health and energy. At a spiritual level, it is expansive and protective, inspiring optimism, natural joy and spontaneity. Sunshine Aura is considered powerfully positive for removing toxins, relieving constipation and aiding digestive issues. It is thought to be most beneficial in assisting treatments for the pancreas, liver, spleen, gallbladder and the nervous system. It helps to bring the body into balance, and may be used in treating Seasonal Affective Disorder and to aid absorption of vitamins A, D and E.